First press this button to unfold the key. Press the open padlock to unlock the vehicle. Turn the key to the left in the driver's door lock to unlock the vehicle. Unlocking is confirmed by rapid flashing of the direction indicators for approximately two seconds. According to version, the door mirrors unfold at the same time. Press the open padlock once to unlock the driver's door only. Press the open padlock again to unlock the other doors and the boot. Turn the key to the left in the driver's door lock once to unlock the driver's door only. Turn the key to the left in the driver's door lock again to unlock the other doors and the boot. Each unlocking is confirmed by rapid flashing of the direction indicators for approximately two seconds. According to version, the door mirrors unfold at the same time as the first unlocking action. 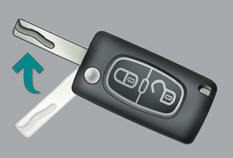 The selective unlocking is only available on versions fitted with deadlocking. The complete or selective unlocking parameter is set via the multifunction screen configuration menu.